NORTH Korea’s latest intercontinental ballistic missile test has provoked understandable alarm, particularly among Americans worried about the threat. 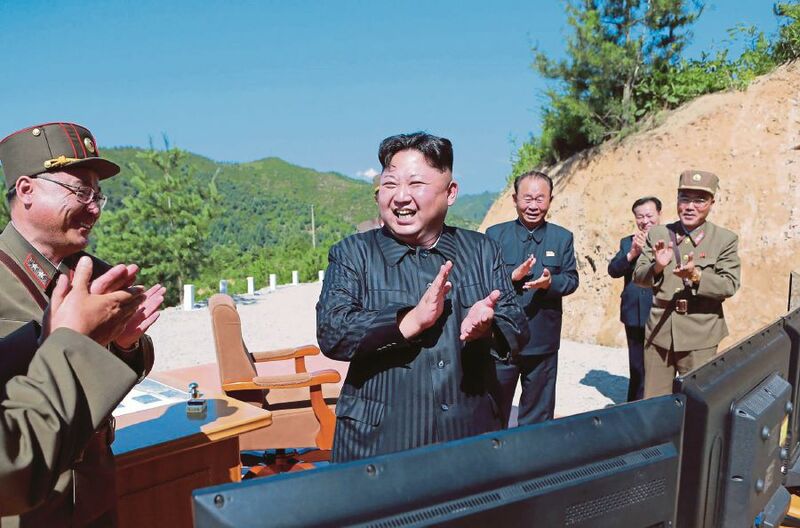 But, many analysts reacted with something closer to stoicism, greeting the launch as dispiriting, but, unsurprising confirmation of North Korea’s capabilities and intentions. For them, news of the test, like the missile programme itself, is unwelcome and concerning, but not too terrifying. It’s worth reviewing, then, some of the fundamentals that guide those experts’ views of North Korea and its weapons. IT’S over. North Korea is a nuclear power now. Policymakers will debate for years the precise moment at which the door closed to preventing or rolling back North Korea’s nuclear and missile programmes. But, that door is most likely now closed. The North Koreans have little reason to give up their weapons programmes, which bring them security against their otherwise vastly superior adversaries, and we have no way to make them. In technical terms, that is described as a “credible deterrent capability”. In non-technical terms, it means the world has few options but to accept North Korea’s nuclear status as a fact of life. NORTH Korea can probably strike Washington and New York now. Past tests demonstrated that North Korean missiles could reach major west coast cities in the US. This test, according to analysts, showed that it can reach east coast cities, too. That probably includes Washington and New York. THE “good” news is that North Korea has no apparent intention of starting a war, which it would surely lose. But, while Kim Jong-un, often portrayed as North Korea’s wild-eyed lunatic leader, might be eccentric, he has repeatedly proven to be rational. Ruthless and morally reprehensible, but rational. And, no rational leader invites national suicide, which is all Kim would achieve by provoking a war. The US has its own nuclear weapons, as well as overwhelming conventional military superiority, to deter North Korea. Historically, deterrence works. It’s how the US has lived for decades with the threat of Russian and Chinese nuclear weapons. CHINA might not be able to solve the North Korea problem. US leaders have, since North Korea’s nuclear programme began, invested their hopes and their strategies in China. If only Beijing were properly motivated, the conventional wisdom goes, it could rein in its North Korean ally and neighbour. But, it may be time to consider why this strategy never seems to work. North Korea is convinced that giving up its nuclear weapons would invite a US invasion, similar to what happened to Libya after it surrendered its own warheads. China can put a lot of pressure on North Korea, but it’s not clear that such pressure scares Kim more than the threat of national destruction. In any case, North Korea and China have been increasingly at odds. North Korea’s weapons tests often seemed timed to humiliate and defy Beijing. China has imposed its own sanctions in response. So, while Americans sometimes perceive China as supporting North Korea’s provocations, in fact the opposite is often true. NORTH Korea may not want war, but it’s still scary. No one knows for sure what Kim wants except for Kim, of course. But, North Korea’s actions still speak pretty loudly. And, they suggest one of two long-term strategies. Analysts disagree about which is more plausible. What these strategies have in common is a desire to secure North Korea’s place in the world. Theory one, most widely held among experts, says that North Korea wants to use its weapons to pressure the world into accepting it as a legitimate member of the international community. This, the thinking goes, would bring trade and normalisation while keeping Kim’s government in power, sort of like China’s opening in the 1970s. That’s scary because it means Kim isn’t giving up until the world accepts his government as it is — cruel, provocative and nuclear-armed. Theory two, more controversial, says that North Korea ultimately wants to reunify with South Korea. The North can never be truly secure, in this view, as long as the freer and more prosperous South remains independent, implicitly undermining the North’s reason to exist as a separate state. This doesn’t mean invading and conquering South Korea outright, but rather slowly building ties between the two Koreas — and breaking the South away from its US protectors — until they reunify bloodlessly. WORRY, but don’t burst a blood vessel. The greatest risk, analysts tend to say, is from an accident or miscalculation that might send North Korea and the US into an unintended conflict. That’s how war would start. Maybe, for instance, the US sends a bomber near North Korea as a symbolic threat, but the bomber veers off course towards Pyongyang, which North Korea perceives as the start of a war, leading it to fire missiles in perceived self-defence. These sorts of scenarios are unlikely and require a number of things to go wrong. But, the odds aren’t zero and, if it happened, entire cities could be destroyed.